Clarrie Grimmett - inferior to Tiger? In this piece I’ll continue my discussion on match impact as a measure of individual achievement in cricket – the description of the method can be found in earlier articles such as this one. It has often intrigued me as to how we can assess the importance of a stay-in-at-all-costs batsman such as Geoff Boycott as opposed to an annihilator of attacks such as Viv Richards – how do these two such disparate types of batsmen impact the state of a match in their different ways? Additionally, and this part of the analysis is somewhat selfish, I have always felt that Clarrie Grimmett has been unfairly overlooked in regards to Bill O’Reilly, and using impact analysis I have finally been able to address this issue to my own satisfaction. Although the careers of Geoff Boycott and Viv Richards did not completely overlap, they can reasonably be said to have played at around the same time and were as such contemporaries. I was fortunate to see Viv Richards play when the West Indies toured in 1976 and I can’t recall ever seeing a batsman so utterly dominant and thrilling. I also saw Geoff Boycott play on a number of occasions, never once being thrilled by him though I could appreciate that not getting out was a positive of sorts. It’s a little like comparing Joe Frazier and Mike Tyson – Frazier would relentlessly wear a boxer down over 12 or 15 rounds, whereas Tyson could render an opponent unconscious in a matter of seconds with a vicious hammer-blow; either way it goes down as a win, though one is possibly more entertaining for the spectators than the other. It occurred to me that these two (Boycott and Richards, that is – not Frazier and Tyson) would be ideal examples to illustrate how impact analysis can be used to assess batsmen who were very different in their method in a way that traditional statistic can’t, i.e. how their innings impacted the state of a match. Although Richards shows a higher level of impact here, the above figures also take into account fielding and bowling, so again we don’t necessarily get a feeling here of the transformative effect of Richards’ batting on matches. So, and even though it goes against what I’m aiming for in terms of measuring overall impact, let’s look solely at batting in detail, specifically at individual innings. At last we’re seeing objectively what we know to be true from observation; while Boycott on many occasions crafted a solid base for his team to build on, Richards produced more high-impact innings. It’s also interesting to look at their career progression in this regard; all three of Boycott’s great innings were made after his 33rd birthday, the first being his 112 against West Indies at Port of Spain in 1973/74, then his 191 which marked his triumphant return at Headingley in 1977, and finally the 100* which guided England to victory over Pakistan at Hyderabad later that winter. Richards meanwhile had already made three of his great innings by the time he was 24; the first was his 177 against India at Port of Spain in April 1976 (that of the great Indian run chase), then the two double centuries against England later that summer. Eight years would pass before his next spate of great impact innings; first was his 208 off 248 balls against Australia at the MCG in the winter of 1984, then his swashbuckling 109* off 111 balls which won the game against India at Delhi in November 1987, and finally the 123 which rescued West Indies from 81/4 to 272/6 against Pakistan at Port of Spain in April 1988. For years I’ve read that Bill O’Reilly was superior to Clarrie Grimmett and never understood why. Fair enough, batsmen could claim he was more difficult to pick, that he was quicker and more difficult to play against, but why, I wondered, wouldn’t this be reflected in their numbers? It seemed to me that the opinion of Bradman on each of the twirlymen had shaped popular opinion. Bradman was influential in bringing Grimmett’s Test career to a close, and even though he was by then at an advanced age, this was partly due to his late start – certainly he still seemed at the top of his game. O’Reilly also had a relatively short career, though in his case the war played a part. In 37 matches, Grimmett exceed 10% bowling impact on 13 occasions, one performance exceeding 20%, which came against South Africa in 1935/36 when he took 7/100 (and 13 in the match) in what turned out to be his final Test. 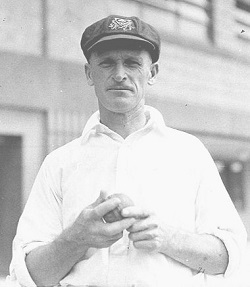 by contrast, in ten fewer matches O’Reilly produced just one less performance than Grimmett with 10% impact or more, and on three occasions exceeded 20%; the first was against England during the ‘Bodyline’ series of 1932-33, as was the second as he took five wickets in each innings of the only Test which Australia won; the third performance over 20% was the 7/189 vs England at Manchester in 1934. This latter performance is interesting in regards to illustrating how impact analysis provides a different way of measuring performance. How can O’Reilly’s 7/189 show up as having such a high impact? Considering that in the Old Trafford match England scored a first innings 627-9d in a drawn match, this seems incongruous; however O’Reilly took the wickets of Walters, Wyatt, Sutcliffe and Hammond to leave England on 149/4 before Hendren and Leyland put on almost 200 for the fifth wicket. The impact analysis gives players credit for their impact at the time of each event, and doesn’t penalise them for what happened after; if a player takes nine wickets in the third innings but his team fails to reach a target of 200 that’s hardly his fault. But at last I have my answer – I can now see objectively exactly what observers claimed, that O’Reilly was superior to Grimmett. Sorry Clarrie! Totally love this, mate. Keep it up. Thanks for all the hard work you are putting in. It is certainly throwing up a lot of interesting stuff. Thanks a lot, mate – appreciate that. Yes, many interesting aspects, which I’ll highlight as best I can.